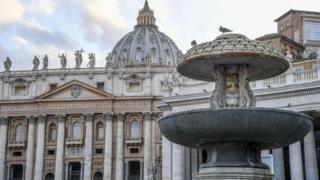 The Vatican has started shutting off its famous fountains amid a prolonged drought in many parts of Italy. Vatican Radio said the move was in line with Pope Francis's teachings on the environment. The Pope laid out his ecological fears in a 2015 encyclical, which denounced wasteful practices and highlighted the importance of clean drinking water. The prolonged drought has hit two-thirds of farmland and has cost Italian agriculture some €2bn ($2.3bn; £1.8bn). The Vatican has about 100 fountains, including two Baroque masterpieces, and all will be switched off, including those in its gardens. Vatican spokesman Greg Burke told Reuters news agency it was the first time anyone could remember this happening. He said it was the Vatican's way of showing solidarity with Rome during the crisis. "This decision is very much in line with the Pope's thinking on ecology: you can't waste and sometimes you have to be willing to make a sacrifice," he added. In its report, Vatican Radio said the Pope's Laudato Si encyclical "recalls how the habit of wasting and throwing away things has reached unheard-of levels, while clean drinking water represents a matter of primary importance because it is indispensable for human life and for supporting ecosystems on land and sea". This spring has been Italy's third-driest in 60 years. Rome itself has suffered two years of lower-than-average rainfall and later this week city authorities will decide whether to introduce drastic water rationing. Some of Rome's famed drinking fountains have already been shut off. The drought has affected many other areas of Italy. A state of emergency was earlier declared in two northern provinces. In southern Italy, hundreds of people were evacuated earlier this month, as firefighters battled wildfires. Dairy farmers and those growing olives, tomatoes and wine grapes are among the most affected, farmers' association Coldiretti warns. There are fears that poor harvests could push prices up. Reports say that milk production has fallen in several areas as cows suffer in the heat. At least 10 Italian regions are preparing requests to the agriculture ministry for a state of natural calamity to be declared, Italy's Ansa news agency said.